Georgina Milhet was out for a horseback ride with her nephew in the suburbs of Miami, Florida, when they turned down a dirt road she’d never been on before. The barns and farms faded from view as the road narrowed — then Milhet spotted a cage. Behind a boulder appeared a crudely made chicken coop, a tangle of metal fencing lying on its side. But it wasn’t the cage that made Milhet gasp — it was the poor soul trapped inside. 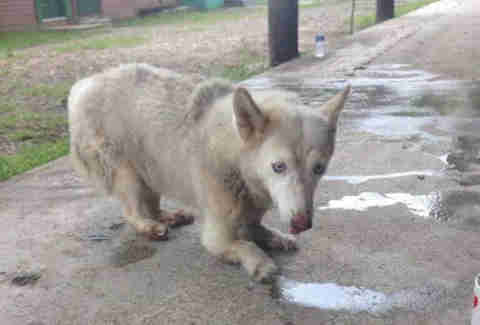 Somewhat revived, the white fox-like dog attempted to crawl out of her enclosure, dragging her stomach along the ground. Milhet reached into the cage and freed the dog from her metal prison, but something was very wrong. All four of the dog’s legs were bent at odd angles and twisted so that they looked broken. Her elbows, on which she supported her entire weight, were scabbed and bloodied, as was her stomach. 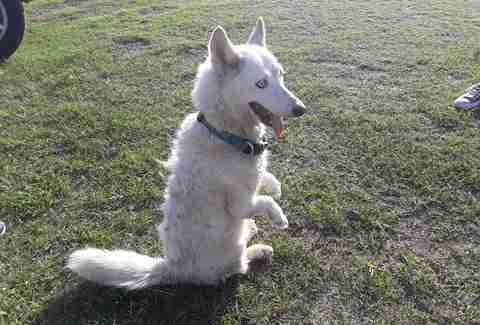 The sight of the neglected dog’s paws made Milhet’s stomach turn. Milhet’s nephew suggested they return with a car, but that wasn’t good enough for Milhet. 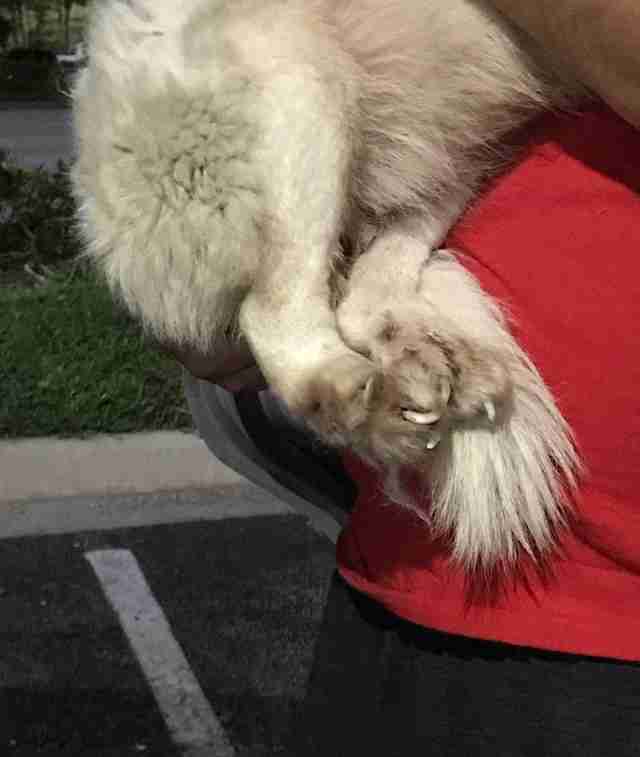 She put the battered husky on the back of her horse, and they rode home. Milhet bathed the dog, whom she named Lucky, and started to cut back her matted fur. Underneath, the dog’s body was covered in puncture wounds and small lacerations, which Milhet assumed were from being trapped in the wire cage. Though Lucky was clearly in pain, her tail never stopped wagging. 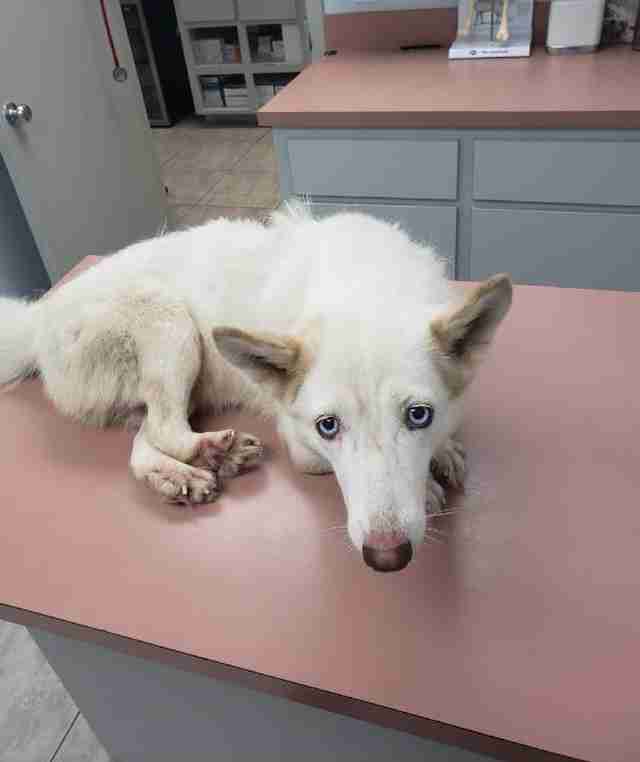 GTS Husky Rescue, a local animal rescue group, heard of Lucky’s plight over social media, and brought her to a veterinary clinic for medical care the next day. 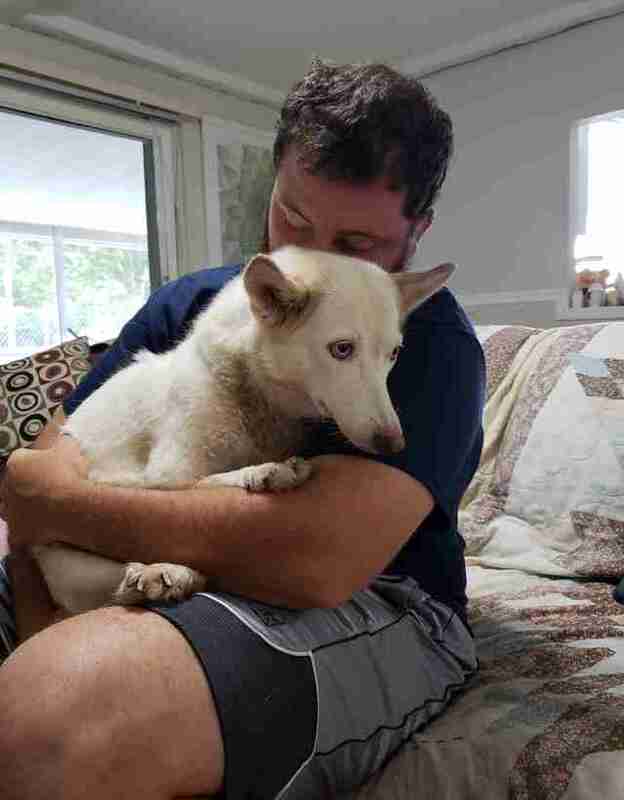 Estimated to be between 2 and 3 years old, tests revealed that the husky had most likely been surviving on her own for some time with no regular meals. 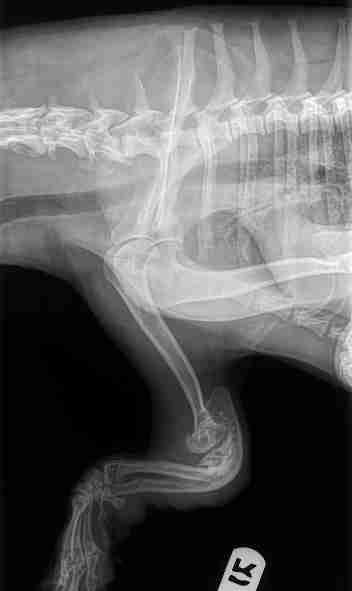 The X-rays of Lucky’s crooked legs left her doctors even more stumped than before. Since the dog was unable to hobble for more than eight steps at a time, Lucia knew her legs needed to be fixed as soon as possible for her to have some semblance of a normal life. However, doctor after doctor turned Lucky down as a surgical candidate. Though Lucky’s legs may always be a reminder of her past, once her health improves, she will receive four specially made prosthetics tailored for her unique way of walking. With the assistance and protection of her prosthetics, Lucky will finally be able to run and play for the first time in her life. 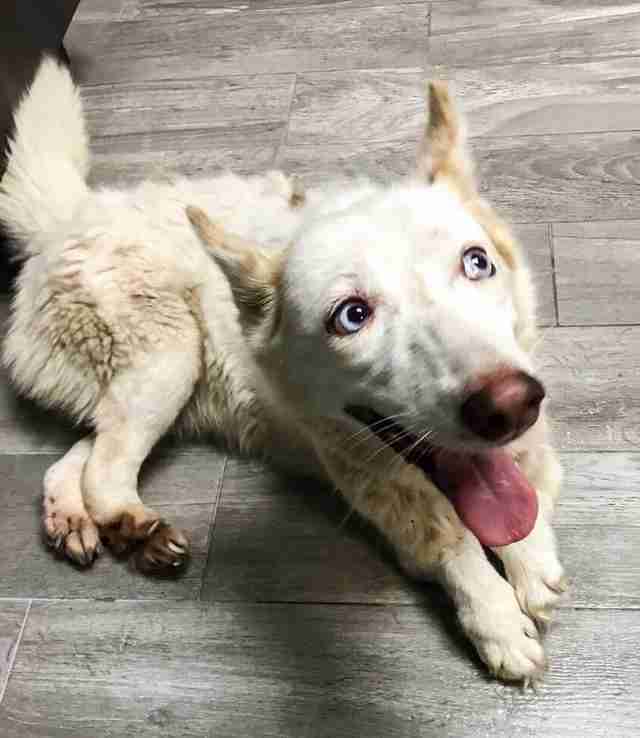 For the time being, Lucky is recuperating at the GTS Husky Ranch, where she is being snuggled by volunteers around the clock. Just three days after her rescue, Lucky is enjoying the simple pleasures of being in a home environment. She’s happy to be in her first real dog bed, though she also loves being picked up and carried around like a baby. Lucia has no doubt that when Lucky is ready, adopters will be eager to have such loving dog as part of their family. 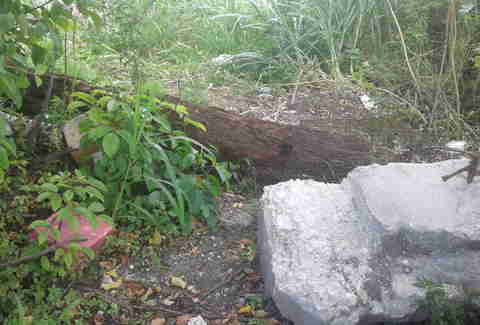 Lucky’s battle to survive has gone viral, reaching the office of Miami Mayor Francis X. Suarez, and rescuers are hoping some lasting change may come out of Lucky’s case. According to Lucia and Milhet, the area where she was found, known as the Redlands, has long been a known dumping ground for unwanted dogs, and rescuers hope that more resources will be made available for spaying and neutering as well as education. Meanwhile, Lucky and her rescuers are taking things day by day. 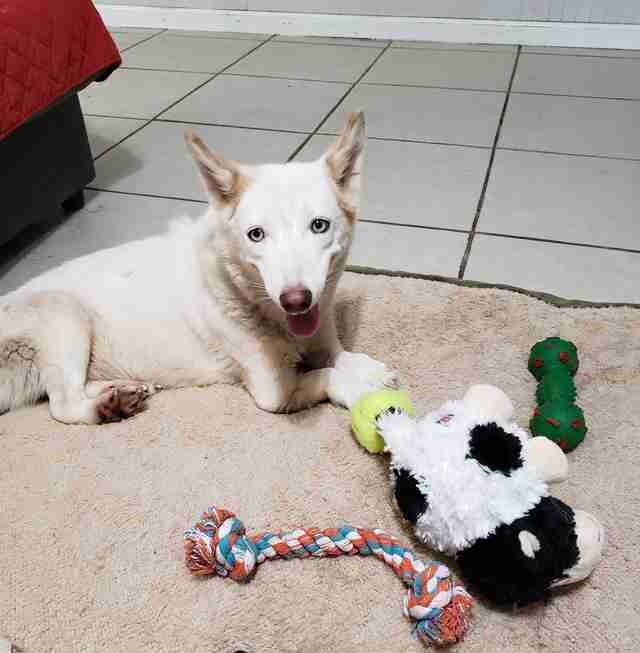 To help Lucky get the care she needs, you can make a donation to GTS Husky Rescue.